Construction details - this looks like 2x8 boards for a 16" height, correct? 4x4 support on the outside with a 1x6 around the top, correct? Do you put the gravel under the planter bed for drainage or under the boards to keep the wood off the ground? Do you line the inside with a landscape fabric? @ alex T. Was this comment for me? How do you keep weeds out of the gravel? What about putting a pond liner? Yes a fence is a great idea. Thanks. Great Do you need anything else i can answer them?? Dimensions of the boxes - What are the dimensions of the boxes, the sitting board, and the side posts? Real Cedar is the trade association for Western Red Cedar.... follow the link and on their home page there is a link to locating a retailer.... there are 43 retailers in Virginia... let them know you found them on Houzz and Real Cedar website! Happy building! Thanks a lot! I'll call one of the retailers. Bed construction - Are the side posts buried in the ground or just sitting on top? Pressure treated posts contain lots of chemicals to prevent them from rotting. We recommend leaving them outside of the cedar to prevent any chemical leaching. When you bury the posts, do you set them in concrete? Or is it enough to just have them in sunk the dirt? Also wondering if it would be safe to stain and/or paint the outer surface of the boards - that wouldn't leach into the soil where the produce is growing would it? Thanks for your help! How wide are the paths between boxes? Assuming that's a bush squash and 2x12s for the raised beds, looks like about 3 feet. Like Rob said, make the paths big enough for your equipment, whatever that is. striped carpet by the yard? Carpet? I don't see carpet....I see gravel. What sort of stain did you use? - And how often would that stain have to be reapplied to prevent the inevitable graying/dulling of the wood? Also, I see what appears to be metal edging on the borders? Is that right? How do you anchor that into the ground and prevent expansion/contraction from the weather? What kind and color is that stain? what kind of wood did use? Just wondering about wood and bug rot? We use rough cut cedar and line the inside with pond liner for protection from the soil. We also like to stain the outside so they last longer. Hi - I really like this design and plan to build in my yard. When you line the inside, are you stapling a liner to the wood and leaving the bottom open? Is the 2x10 lumber setting on the gravel or dirt? Is there gravel under the dirt? Did you put newspaper at the bottom or screen? desert garden - Concern with raised wooden garden box. Heat will rot from sun quickly. What box won't damage quickly from sun???? Is this crushed granite? - What type of gravel did you use? It looks good. You can use just about any aggregate. Granite is pretty but it has sharp edges and it is not good if barefoot, pea gravel is smoother and softer and has great color. This is not my picture so I do not know what was used but it is simple and easy to care for and maintain. How tall are the boxes? Love the design! The boards are true 2 by 10 rough cut cedar for a total of 20"
What are the demensions of these boxes? Did you put in irrigation? They are 4' by 8' and we do install drip irrigation from the bottom before we place them. Website - Website address not working. New website? Time to update. Gravel depth - How thick should the gravel be, and how far do you put the post in the ground?? What's the distance between boxes? - For the path. Is 2 feet enough? Thank you! It looks beautiful and so functional! trellis addition? - Has anyone added a trellis? I built 3 garden boxes, but as I am growing cucumbers & peas, would like to add a trellis. If so, please share your inspiration. Thanks. Hey there, nice work, I've been a stone mason for many a year and trul - Due to physical limitations that too many years of my trade have imposed upon me I've been involved in a not for profit community garden where I will, if the grant money appears, will be designing an out door community kitchen to compliment the garden. I've chosen to work with cob or hay bale construction for the project which will be partially clad with mosaic designs. Unfortunately though, the persons whom were originally involved with the inception of the garden built less than superior raised beds and will have to be reconstructed if we expect to enjoy any longevity. The garden is for the use of the whole community in a small Victorian Village on the the South Shore of Lake Erie but as there are no age limits to whomever would like to volunteer time the project is however designed to teach our Youngster's the virtues of ethical farming practices, Echo building and sustainability as well as how to can, dehydrate and preserve healthy food for the long cold winters ! Now, by now you may be wondering why I've bothered to share our ambitions with you and the reason is simple. I am so impressed with your work and therefor am hoping you might be willing to shed some light on the construction of your raised beds, i.e.materials, layouts and even the pitfalls in which to avoid ! I look forward to your response and thanks again for sharing your talent !!! Sincerely M C Ryan @- mosaicisti4@gmail.com Cheers ! I have Rob's planter boxes, love them! - I live in Vancouver Wa, I have Rob's planter boxes and love them! what are the length and width dimensions of the box (perimeter)? 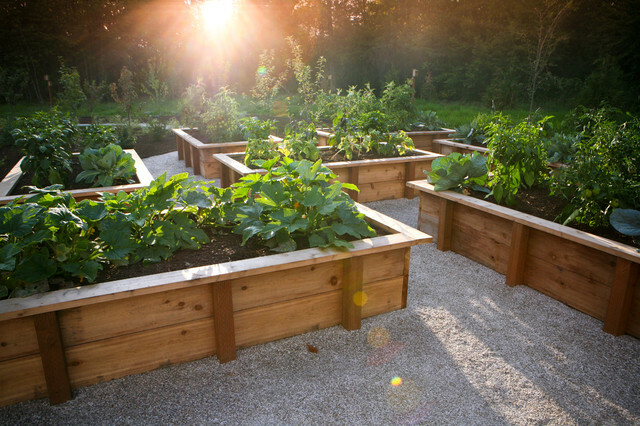 like raised garden beds - Before filling with dirt, is there a liner or a wood preservative so the wood doesn't rot ? Here wood boxes create a spot to perch while you pick your veggies and herbs. The classic gravel treatment is affordable, practical and beautiful. Traditional raised garden boxes work double duty, as they also provide a bit of seating along these neat garden paths. Water: Timing is everything. Cooler temperatures make early mornings and late afternoons the ideal times to work in the garden in July. Water plants early in the day when evaporation rates are low yet there’s plenty of time for foliage and mulch to dry out, reducing fungal-growth conditions. has a nice seating edge; do we want that?